CNN International's World's Untold Stories ran a four episode series called "Trapped", which followed the stories of Nigerian women who had been trafficked to Denmark. Michelle Mildwater, a psychotherapist and project leader for www.hopenow.dk/ was the consultant and narrator for the series. The first shows aired in February, and the second half ran in March. The first show told the story of Anna, a Nigerian woman who was trafficked to Denmark. She explains the trauma of the work she was forced to do, the terror she felt every day, the beatings she endured upon trying to escape, and how she could not go to the police knowing she would be deported back to Nigeria, where her traffickers await a payment for themselves. The show also spoke with a Danish NGO that offers medical services to victims, and the representative explained how from 2003 onward, there has been a significant increase in Nigerian women who have come to seek services. By the end of the show, Anna was caught during a police raid, and was set to be deported as an illegal immigrant working illegally in Denmark. No mention of any attempt of an identification process or anything. Unfortunately, CNN does not provide a way to embed their videos, but you can access the program here on their website. This is the story of Joy, who is a Nigerian woman also trafficked to Denmark with false documents, but was caught at the Danish airport where upon Danish authorities arrested her for falsifying documents. She has been in prison for six months, and has given up attempting to seek asylum. No one has attempted to identify her. Joy's illiteracy holds her back from helping herself. She will be deported without any assistance to her situation. The link to the second show is here. In the third show, Michelle follows Joy back to Nigeria. It gets a little deeper into her personal story. Joy is from outside of Lagos and she has been bought and sold since she was ten years old within Nigeria, then trafficked to Mali and then Denmark. After being caught in Denmark illegally, she was deported back to Nigeria with 100 Euros, which she promptly had to pay to Nigerian authorities to release her from the airport. Despite seeking help with an evangelical Christian community, she was turned away for not being able to contribute some money for her stay. Michelle travels to a village outside Benin City. She interviews some people in the village. A woman explains that none of her children are able to go to school so she is trying to teach her children to read, despite the fact there are little to no resources. Some women even offered for Michelle to take their children. One mother explains she does not want her daughter to stay in Africa; she wants her to go somewhere, anywhere to get an education. Michelle also spoke to a woman who sold her house for her children to be taken to get jobs, but she never heard from them again. Another woman also sent her daughters to Europe, and she believes her daughters are working as hair-dressers, but she has not heard from them either. There is this automatic assumption that Europe is full of great jobs and that even poor, African women are able to get them. 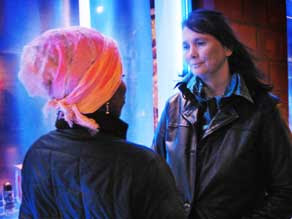 Michelle finds Anna, who is hiding from her traffickers and cannot go back to her village. Her traffickers are beating and threatening her parents, and she must move from place to place to keep away from them. Even calling her parents is risky. There are some nuns who picked her up at the airport, but due to limited funding, cannot help her for long. Everything comes back to money. Here is the link to the fourth show. This simply to say thanks to theproducers and directors ofthis facinating story about my country,iwish i can assist inthis fight against trafiking?i askhowcan u stop aproblem without finding the solution?the problem is you cant stop people from travelling b/cos many are living below a doller per day, while billions are farried abroad by the so called leaders,whatalso are u doing about embassies collecting huge sums andnot issuing visas are they not part of the problem? Thanks from Charles Jesse Opara (leadership&legacy foundation)leaders4legacy.co.uk, 2348027503166. I had wished for an untold stories, where the world will see what is happening to our communities where the worlds oil are taken from most expecially Nigeria and see the inhuman treatment of oil companies and some of our socalled chiefs or community leaders who they have used to exploit our immidaite communities plus political intrests that have led to hostage taking and militancy in the NigerDelta.